The Banking Royal Commission and subsequent release of yesterday’s report have created the perfect storm for positive change within corporate Australia. Whilst not diminishing the misconduct that has occurred, it provides an opportunity for companies to pause and reassess their priorities and consider more deeply their purpose with regard to customers and society more broadly. We believe that shared value as described by Porter and Kramer in the original Creating Shared Value 2011 HBR article is part of the solution to restoring faith in business. Shared value offers organisations the opportunity to put customers back at the core of their strategy and to respond to the increasing expectation for business to address social issues. We have witnessed in the last five years through the work of our members particularly those in the financial services sector, including NAB, a genuine desire and determination to change the way their businesses have traditionally operated. Whilst we recognise the need for immediate action, shared value provides a framework for a long term sustainable solution and we will continue to support these companies in taking the longer view. 2019 marks a significant milestone for the Shared Value Project, our fifth anniversary year and against this landscape never has the need for shared value and the opportunities it can generate been more apparent. Ready to start your shared value journey? How do organisations need to prepare themselves for the largest wealth transfer in history: $24 trillion from baby boomers to millennials? BlackRock CEO Larry Fink takes a shared value view and says strengthening the link between profit and purpose is key to long-term success. Shape your future business strategy by gaining a unique insight into what the future of Australia could look like in this exclusive, member-only briefing session run by Director of CSIRO Futures, James Deverell. This is a member-only, complimentary event. Places are limited. James Thornton, Chair of SVP member, Intrepid Foundation and CEO of Intrepid Group says that creating shared value has made him stronger as a leader and has made Intrepid more resilient and innovative. In this episode, Ramana James from IAG talks to Dan Baum from The Redwoods Group about the importance of being a purpose-led organisation in the insurance sector. We are seeking expressions of interest for a volunteer to assist SVP with social media outreach, communications and research from March - July in the lead up to the 2019 Shared Value Summit Asia Pacific. There is a revolution happening in business. Traditional models are lacking the competitive edge and connection with what consumers really want. This workshop will help you get your head around shifting business trends to find a strategy ahead of the curve. Tickets are $350.00+gst for non-members and $250.00+gst for members. 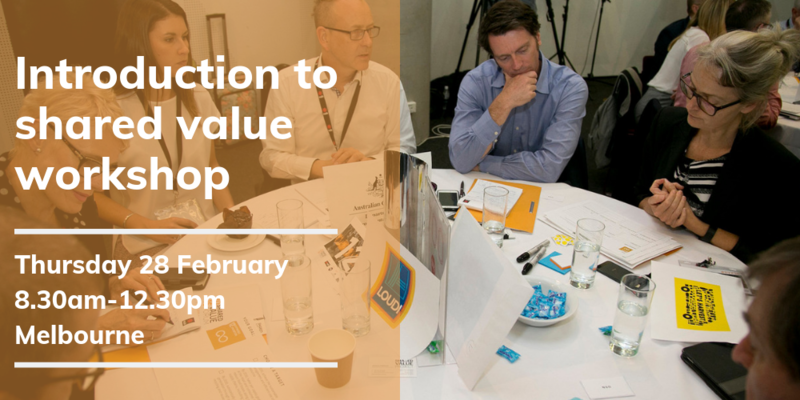 Members, contact info@sharedvalue.org.au for your special access code. Catch up on highlights from shared value in the media and the global community. 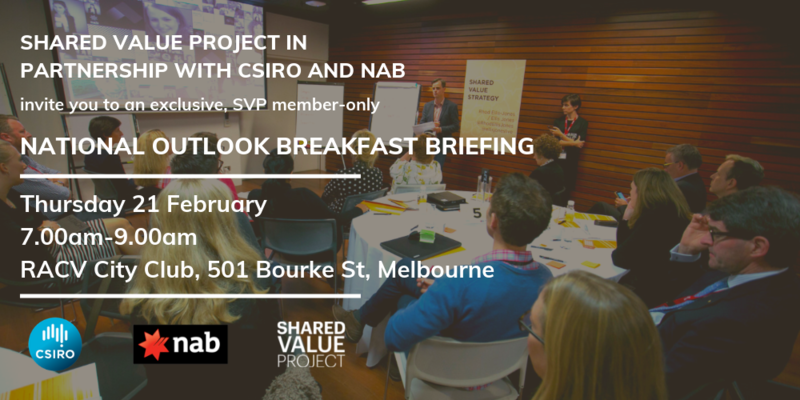 As a member of the Shared Value Project, organisations have the opportunity to be a part of the community shaping the future of shared value in Australia.